After buying a Raspberry Pi with the intent of using it as a media streaming box, I soon found the allure of turning it into an emulation station too intriguing to resist. 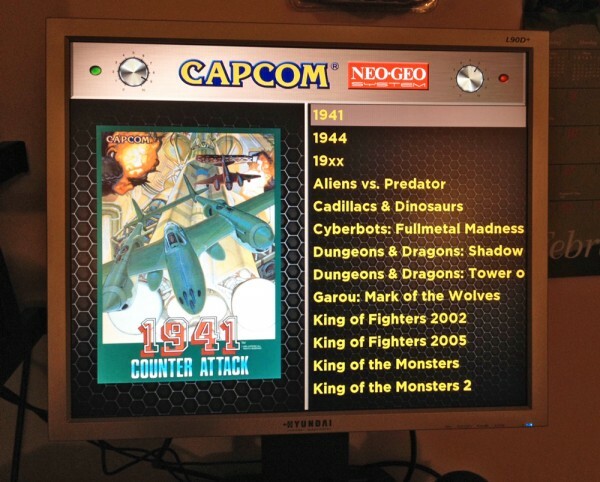 I went with the RetroPie all-in-one solution for the software platform. It took a few weeks to get everything configured to my liking and running properly. I chose to focus on MAME, Neo Geo, Capcom (CPS 1 and 2), Playstation, SNES, Genesis and TurboGrafx 16 systems. Being a graphic designer helped quite a bit in that I was able to design my own custom screens for each system in addition to the splash screen. 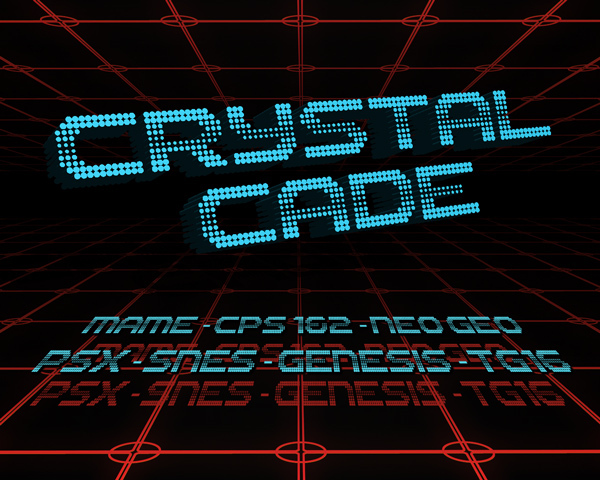 My last name is Crystal, so I decided to play off of that for the name of the project. My intention was to have a curated list of games that I knew I was interested in playing. I have previous experience with emulators on various platforms and I never got much use out of them. The problem was the paradox of choice. With too many options, I chose not to play anything. After seeing how finicky some of the emulators were, that also forced me to curate the games, rather than simply have a bunch of non-working titles. Here is a snapshot of the custom menu I designed for the FinalBurn Alpha emulator. I knew I had a 19″ 4:3 lcd monitor collecting dust in my Dad’s basement and I thought this would be a perfect project to get some use out of it. Building a full MAME cabinet was too intimidating as a first project, not to mention living in a cramped third floor apartment doesn’t really lend itself to something that large. I decided that I wanted to make a relatively small enclosure that can sit on a table or counter top. Something I can bring to a friend’s place, plug in and start playing immediately. I wanted the most flexibility and portability possible, so I decided against making built-in controls. It’s a lot more comfortable to kick back on the couch with a wireless controller than being hunched over with your face a few inches away from a screen. 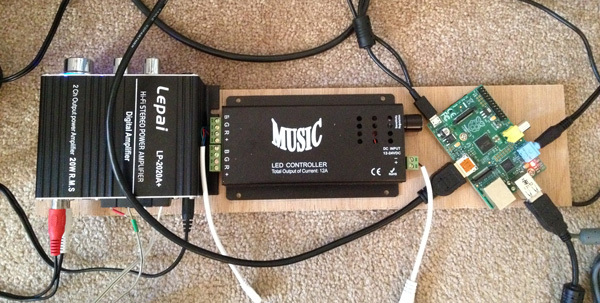 Amplifier for speakers, sound-activated LED controller for the marquee and the brains of the operation, the Raspberry Pi. After becoming addicted to looking at MAME cabinet projects online, I decided I wanted to go in a different direction and use real wood over MDF, which is the MAME cabinet material of choice. The weight would be about the same or lighter and I could go for a more natural look, rather than coating it in paint. I didn’t want to go full steampunk, but I loved the idea of a shiny cherry finish with gold accents. I started designing the enclosure in Adobe Illustrator and settled on a final design after several revisions and dozens of measurements. The revised sketch for the enclosure. Lots and lots of numbers. 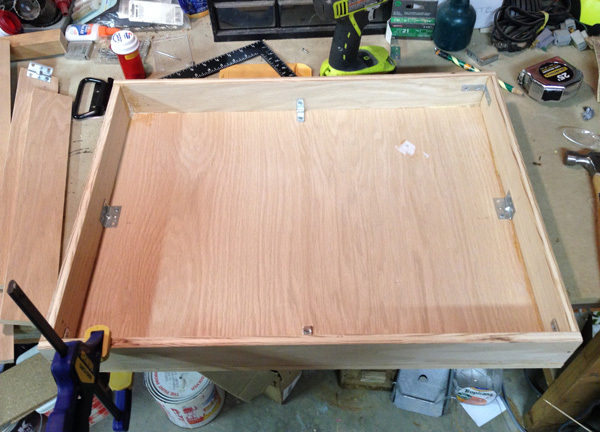 Although I do some woodworking with modifying wooden cigar boxes, I really don’t have practical woodworking skills. I designed the enclosure with this in mind, keeping the basic shape a box. No fancy curves or unnecessary flourishes. The most complicated part would be cutting out the monitor and marquee windows, which I couldn’t see a way to cheat around. I didn’t know anyone with router experience that could cut out the front panel for the enclosure, but I did know someone with a cnc laser! I asked if he could cut through plywood, knowing full well there would likely be scorched edges, but also knowing that the precision would be perfect. 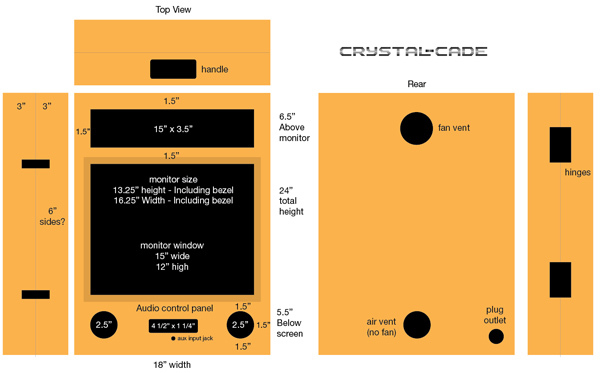 With his agreement, I redesigned the speaker ports from simple circles to a geometric pattern that would help reinforce the crystal theme of the project. I kept everything in the grille pattern 1/8″ thick to help stability. 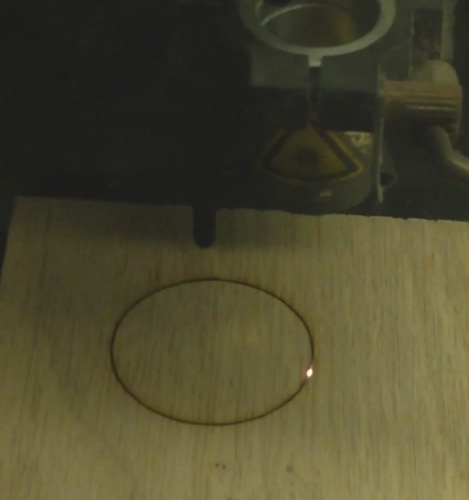 Screenshot from a video my friend sent me during his test cutting of oak plywood with the cnc laser. I was originally going to use 1/2″ Birch plywood but after checking stock in a few stores, I decided to go with 1/2″ Oak plywood. The oak boards were a bit heavier but had a much nicer grain and density to them. My father has a pair of table saws and in an hour or so, we were able to cut out the frames for both sides of the box. 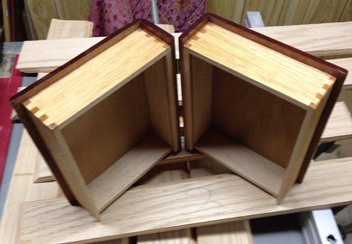 I found a cigar box with a similar structure to what I had planned, which helped me explain the box as we went along. 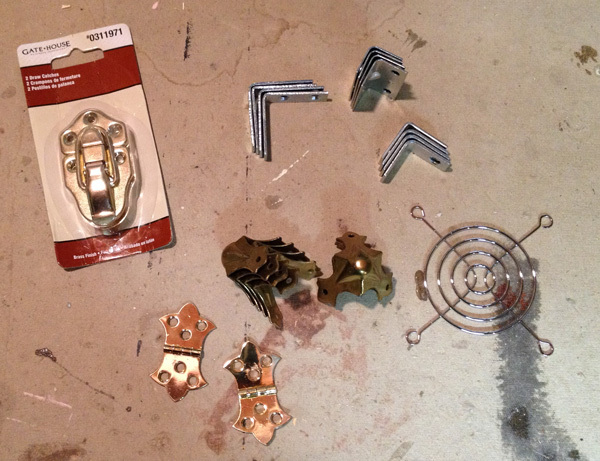 I found some corner accents that will serve as protection from dings and scrapes. Non-electronic hardware for the box. Back of the box mostly together.